The Tajima Brewery is located about 15 miles inland from the Sea of Japan in the Momozono area of Fukui City in the mountainous Fukui Prefecture. They have specialized in the Yamahai method of sake brewing for over 100yrs and make nearly all of their sake in this way. 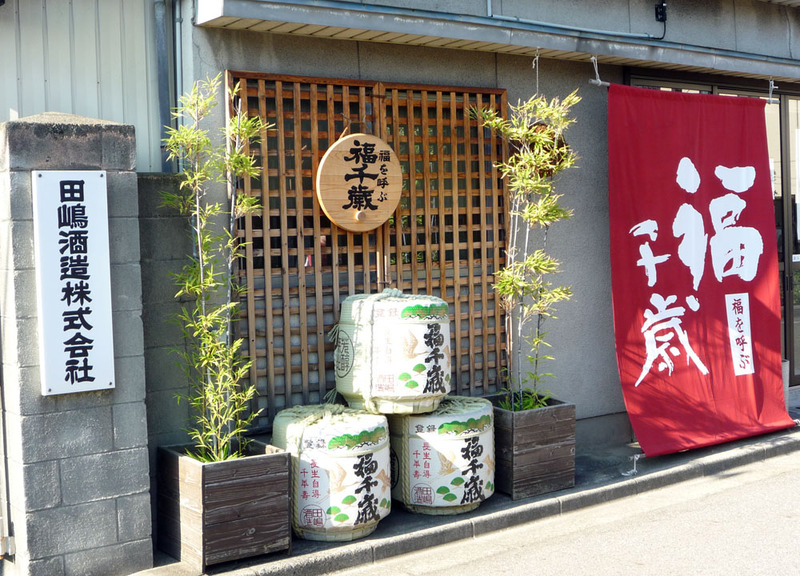 While most breweries in Japan switched to the more modern Sokujo method by 1911, the Tajima brewery finds excitement and magic in the Yamahai process and its results. For these reasons, they will never give it up. Established in 1849, the brewery is managed today by the 6th generation president, Tokuhiko Tajima. With just 4 kurabito, or brewery workers, they are a small brewery and do every step of their brewing process by hand. The incredible skill and patience needed to make their highly acclaimed, exceptionally layered and complex Yamahai Sake year after year requires three times as much work and time as the modern Sokujo method. To make sake this way, Tajima brewery believes teamwork plays a critical role. When it comes time to press the sake, every member of the staff including the Toji, or brewmaster, the kurabito and all other members engage in tasting sake from the tank to decide when exactly the sake should be pressed. The unanimous agreement among all members determines the flavor of Fukuchitose. Tajima brewery uses local sake rice grown in Fukui. They are lucky to have an abundant source of highly prized soft water, which is ideal for brewing. They make everything from Futsushu to Junmai Daiginjo all in the Yamahai method from these local ingredients. When beginning the brewing process, most breweries transfer the steamed rice to tank immediately after it has been cooled. Conversely, Tajima Brewery allows steamed rice to sit in open air for a long time so the rice can absorb air-born microorganisms. 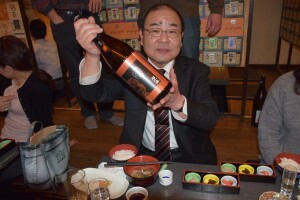 Mr. Tajima adds: “of course this process is invisible to the human eye, this is the moment you feel a sense of romance…in terms of flavor, Yamahai sake from other breweries tend to be robust with high acidity. Our Yamahai has a more mellow attack and you can taste the umami and rice afterwards… it is fragrant and rich.” In terms of their techniques and craftsmanship, they strive to be the “only one” accomplishing this level of highest quality. The label of Fukuchitose communicates the attitude and personality of the brewery itself. 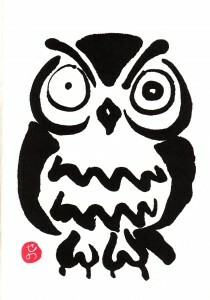 Fuku means “happiness” and chitose means “forever.” The mascot is an owl, which is loved throughout the world as a bird that brings luck. Their hope is that when you drink Fuku Chitose sake, you will have happiness and luck forever. Fukui is a mountainous prefecture bordering the Sea of Japan with 35 small-scale breweries in operation today. The area is blessed with abundant seafood as well as great food from the mountains. Specialties of the area include Oroshi Soba, soba served with grated daikon and dashi, heshiko, mackerel pickled in salted bran-paste, and Echizen crab (only in winter). Also popular in the area are foods with strong flavors like tempura and sukiyaki. The Tajima brewery feels lucky that the local foods, as well as the richer flavored foods across the world, go very well with their sake. He recommends drinking Fuku Chitose with hamburgers and steak.